The American Horse Council Foundation (AHCF) commissioned a 2017 Economic Impact Study nationwide and just released economic impact breakdowns for 14 states. 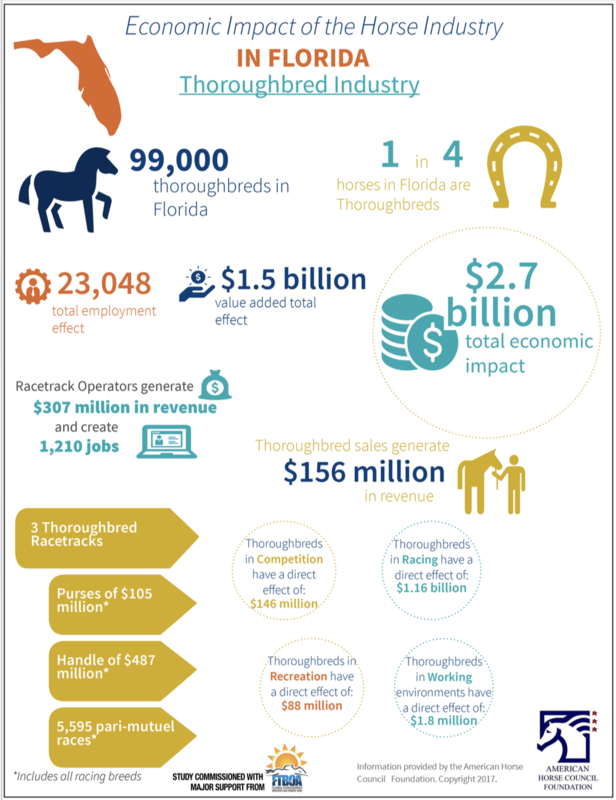 With major support from the Florida Thoroughbred Breeders’ & Owners’ Association, the Florida study focused on the overall impact of equines to the state, and specifically the impact of thoroughbreds in racing. “Our job at FTBOA is to promote, advocate for and enhance the economics of our state-wide industry at home as well as outside our state and national borders. This fresh American Horse Council study clearly demonstrates the importance of our mandate on behalf of the entire state industry. Our breeders, farms, tracks, owners, conditioners and equine professionals are top-shelf, which, along with our weather and quality of life, make Florida the greatest place to breed, sell, own and race,” said Lonny Powell, FTBOA CEO. • One-in-four horses in Florida is a thoroughbred. • The direct thoroughbred industry impact is $1.5 billion with the total impact exceeding $2.7 billion to the state, an increase from 2005. • The racing sector continues to have the largest economic impact with a $1.16 billion direct impact. • The total thoroughbred employment effect is more than 23,000 jobs. • Thoroughbreds are versatile in the economy: contributing $146 million via the competition sector, $88 million from the recreation sector and the working horse market adds $1.8 million. • Thoroughbred sales generate $156 million in revenue. 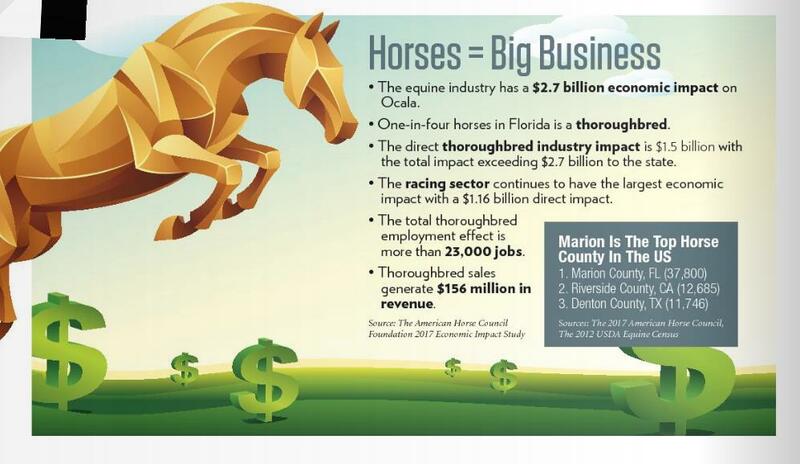 “The economic impact of the equine industry in Florida, led by our thoroughbreds, is simply amazing. Only California and Texas have more horses of all breeds with more than one in four of our almost 400,000 horses in Florida being thoroughbreds. Our Horse Capital of the World™ moniker is certainly deserved,” noted Powell. “Economic impact studies are key to making a case to legislators who can impact the industry. These latest numbers from the state and county studies by AHCF will be shared at all levels of government, including key state, county, and city officials to ensure a full understanding the role the industry plays economically and its impact to the job force. The study also provides guidance to other state industry sectors including hospitality and transportation as they see the sustained and growing impact equines have on them,” said Tammy Gantt, FTBOA Associate Vice President. The last statewide study focused on the impact of racing breeds was released in 2014 and was presented to the Florida Senate on Gaming. It was commissioned by several stakeholders including FTBOA, Florida HBPA and Ocala Breeders’ Sales Company and conducted by Cummings Associates and Civics Economics. At that time, the racing breeds economic impact was reported at approximately $1 billion. The 2017 study shows the direct thoroughbred industry impact at $1.5 billion with the total impact exceeding $2.7 billion. The 2017 AHCF study drills down further showing the impact equines have on travel, dining and lodging and academics. 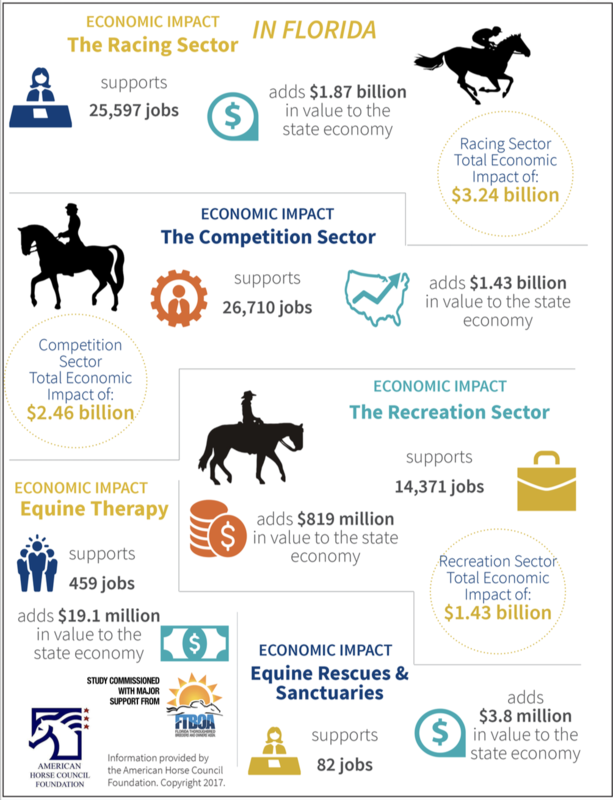 “The study found that our thoroughbred industry alone in the Sunshine State generates an attention-getting 23,000 jobs and a robust $2.7 billion in total economic impact. We continue to have a notably greater economic impact than our signature baseball spring training. The study clearly supports the train of thought that the Florida thoroughbred business, along with our entire equine industry are not only worth preserving, but supporting and growing as well. Florida is most fortunate to have such an industry and agri-business already well established within its borders just as we Floridians are fortunate to live and work here,” said Powell. Nationally, Florida ranked second in its total direct effect on employment at 73,935 jobs, compared to the other breakout states. Kentucky, the leading thoroughbred producer worldwide, ranked first with 75,265 jobs. Other states receiving breakouts included California, Colorado, Illinois, Kentucky, Maryland, Michigan, Minnesota, New York, North Carolina, Oklahoma, Pennsylvania, Virginia, and Wisconsin. 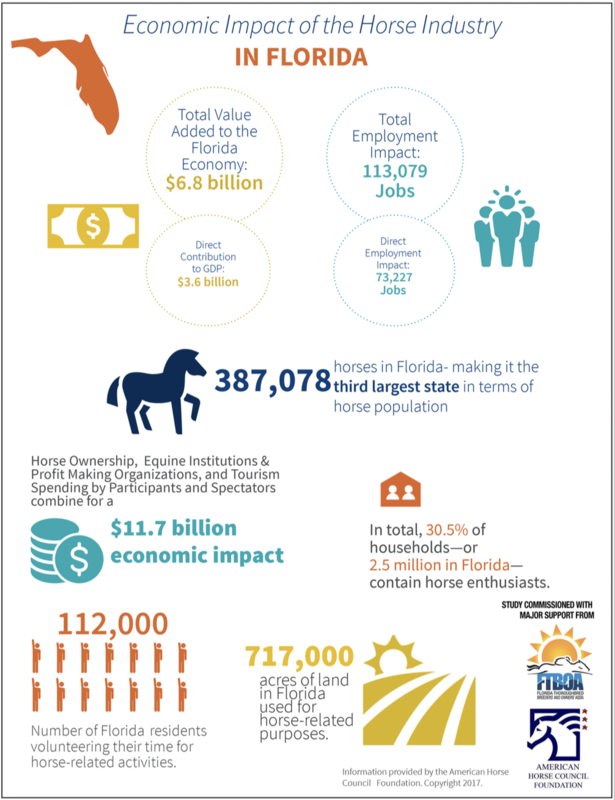 For more information on Florida’s Equine Economic Impact, take a look at the infographics provided below. This article and research is courtesy of the FTBOA and American Horse Council.